Product and service quality play the significant role in business sustainability. The same thing applies to garments as a product. In the buyer's market, quality is the core of a business for what it gets acceptance and credibility among its clients. This article shows quality control practices that are being followed by most of the organized garment export houses. The fabric is the primary raw material and most costly item in apparel product manufacturing. A defective fabric will produce a defective garment. To avoid fabric related defects in garments, fabrics are inspected prior to cutting. Depending on the quality standards 100% inspection or 10% or random lot inspection is done. Common defects found in fabrics are like - weaving defects, holes, printing/dyeing defects, water crease marks, color variations etc. Factories generally follow 4-point system for fabric inspection for woven as well as knits fabrics. All trims are checked for durability and performance. All trims are attached correctly using proper attachment methods. Ribbons ends are heat sealed. Trim materials are checked to perform consistently with the base fabric performance with no differential shrinkage. Shade variation in cut bundles is being controlled. Other important quality aspects that are taken care are like – using a pattern according to fabric shrinkage, controlling fabric skew or torque, all plaids, horizontal/vertical stripes are given extra care so as to match the stripes. Light weight fabrics are relaxed to avoid measurement error while stitching. Quality is checked whether garment construction meets with the buyer requirement like garment measurement, stitching quality, seam quality, trims and label are attached correctly. All the garments are given sufficient time to relax and dry thoroughly prior to packing to avoid foul smelled. Thread cutting, ironing, spotting and other finishing processes are done under strict quality control measures. 100% garments are checked for - Correct labeling, hangtag positioning and carton marking, Correct ratio packing, quantity check in each carton as per the packing instruction. All the packed garments are inspected 2.5AQL quality audit before forwarding goods to the buyer's Q.A. team. To ensure no broken needle remain inside the garment, all kids garments are passed through a metal detecting machine. Secondly, garments with small parts embellishments as sequins, beads etc. are labeled with "WARNING...CHOKING HAZARD". Accessory items with sharp points and edges are not used on children garments. Button pull strength, a sequence as per the buyer's requirement. Quality of the garment to be made as per customers requirement. To make consistent quality garments and controlling defect generation, factories need to set up quality procedures ad quality systems. 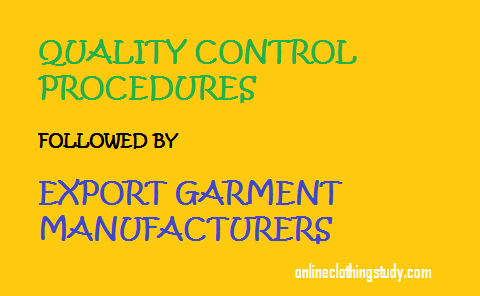 Quality Control Procedures followed by garment manufacturing factories.